What Is an Online Counseling Degree? Counseling, much like psychology and social work, is a word that serves as a very large and general umbrella for a variety of educational options that fall into the category. For example, there is clinical mental health counseling, there is school counseling, there is addiction counseling, there is counselor education, there is community counseling, etc. The list goes on for quite some time and it cuts a rather wide swath across the social health landscape. Many conflate online counseling degrees with online psychology and social work and even marriage and family therapy degrees. The mistake is common and understandable. There is a lot of overlap and commonality between the subjects, but there are very distinct differences in each field as well. Counselors and clinical psychologists are both trained to provide counseling and psychotherapy, especially at the graduate level, counseling programs can be found in arts and sciences departments, education departments, and of course, psychology departments. 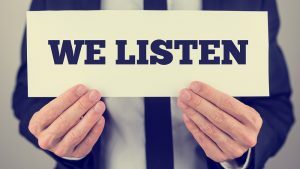 Also, counselors are helping offer advice and strategies for helping those with disorders or emotional issues function in normal society and live a normal life. Psychologists are responsible for more of the treatment and potentially healing of a specific person’s issues. The three similar subjects will all likely contain similar concepts, research methods, vocabulary and best practices. At the PhD level, it will be entirely impossible to tell the difference between an established psychologist and counselor, at least in terms of their Psychologists and social workers likely study many of the same subjects, concepts and research methods during their educational careers, but they use those studies in very different manners which means that each program has areas of study that are unique to the subject. The rise of online counseling degree programs is also in line with a similar rise in online psychology and social work degree programs. Online graduate degree programs have seen a spike in popularity in the last 10 years and the mental health field has been a big beneficiary of that. Whereas some subjects have not lent themselves as well to the distance education and online format, psychology, social work and counseling have all become a huge part of the base of online college coursework. Per the Council for Accreditation of Counseling & Related Educational Programs (CACREP), there are 49 accredited online counseling degrees offered at the graduate level and another five programs that are in the midst of the accreditation process currently. There are also a few other online college and universities offering Master’s degrees and PhDs in different types of counseling, but CACREP strongly recommends that students interested in a career in counseling choose an accredited program because of the employment doors that accredited degrees help open. The good news about the fact that there are less than 50 accredited online counseling degree programs is that the options are easier for students to research. Unlike online psychology and online social work degree programs, the options are significantly more limited for students looking for an online counseling degree, primarily because they are highly concentrated at the Master’s level. There are technically four types of online counseling degrees available to students -- a Bachelor's degree, a Master's degree, a research doctorate (PhD) and a Doctorate in Education (EdD). But for all intents and purposes, there are just two options, the Master’s degree and the PhD and even then, the online doctoral degrees in counseling are all Counselor Education and Supervision programs, and there are just five accredited programs like that in the country per CACREP. Most industry professionals still consider the Master’s degree in Counseling to be the only degree students really need to become a professional in the field and state laws back that up. To qualify for licensure and to even sit for the National Counselor Exam (NCE), most states explicitly require the applicants to have obtained at least a Master’s degree in a specific counseling program or a related subject like Marriage and Family Therapy or Clinical Psychology. Online bachelor’s degrees in Counseling are rare, in large part because any type of bachelor’s degree in counseling is rare. Most students who wish to become a counselor will spend their time as an undergraduate studying education, psychology, sociology and potentially even business administration. That isn’t to say that the programs don’t exist. There are schools like the University of Phoenix, Liberty University and Aspen University that do offer online bachelor’s degree programs in subjects like mental health counseling and addiction counseling, but these programs are few and far between. There are still plenty of differences between the different online counseling programs, especially when you consider the fact that “online counseling degree” could really be a degree in any of eight different specific subjects. Traits like price, accreditation, coursework, in-person requirements and resources are all things that students should be researching as they pick a program that is best for them. Students would be wise to do their homework if only to make sure that they are choosing an accredited program and ensuring that they are avoiding the fly-by-night degree mills that always seem to rear their ugly heads in the online education space. Using information collected from former students, professors and professionals in the counseling field, this is designed to be a resource guide and information hub for students looking at online counseling degree programs. The best way for students to pick the program is still to contact schools individually and speak with members of the counseling department or admissions office about how the programs suits specific needs. In psychology, bachelor's degrees are among the most popular of any subject. This is true for online psychology degrees as well. It is different when we are talking about counseling-specific programs. The primary issue is that a bachelor’s degree in Counseling doesn’t open many employment doors. Most employers and states require counselors to earn at least a Master’s degree in the subject before they can apply for licensure. This means that a bachelor’s degree in counseling would only qualify a graduate for assistant positions in research and doesn’t qualify any student to perform any sort of professional counseling or treatment. State regulations combined with a lack of job opportunities make online bachelor’s degrees in counseling difficult to find. Even the schools that do offer specific online bachelor’s degrees in counseling usually offer them in conjunction with education in psychology, or human health services or sociology. It is important not to conflate the overlapping subject fields. There may very well be a lot of overlap between a bachelor’s degree in psychology and a bachelor’s degree in counseling and a bachelor’s degree in sociology, but there will also be plenty of unique coursework that will make a difference in students’ future education in the subject. Bachelor’s degrees in psychology are specifically designed to train students for an advanced degree in the mental health profession. A bachelor’s degree in sociology and human services may help prepare students for some aspects of a graduate degree in counseling or a related mental health field, but it is not specifically designed to do so. The prerequisites for an online bachelor's degree program in counseling are very straightforward. Each school will have different requirements, of course, but most schools offering these degrees are looking for a completed application, high school transcripts, any other transcripts from previous community colleges or universities and a minimum GPA of 2.0. Many of these programs will allow students to transfer credits in from other programs but those credits are not required like they often are in online psychology and social work degree programs. This will often allow the student to skip over general coursework at the beginning of the degree program. Students enrolling in an associates or bachelor's degree program who have not previously earned college credit from an accredited institution may need to complete classes like Intro to Communications and other intro classes before the student if officially accepted into the program. The price of an online bachelor’s degree program is relatively straightforward as well. For example, one school charges $150 per credit and requires 120 credit hours for graduation. Using some simple multiplication, you can easily determine that, based on those prices, tuition for this program would be $18,000. Another way to do that math is that the school charges $450 per course and 40 courses are required for graduation. Other schools may charge closer to $500 per course. It is likely worth contacting the school’s office financial aid to make sure you understand exactly what you are being charged. Keep in mind, each school likely charges fees for things like textbooks and technology. For example, some schools charge $10 per transcript, $20 for technology, $100 for a graduation fee, $4,000 for textbooks and $100 for the proctored exam. These are relatively straightforward fees and are common across the board. There are also degree completion opportunities that serve as more of a prerequisite for some of the advanced degree options. Those programs require significantly less credits for graduation and are especially good for students who know they want to go on and enroll in an advanced degree program in counseling. The curriculum for an online bachelor’s degree in counseling is straightforward as well, primarily because the subject-specific coursework is still general and there aren’t a lot of real-world experience requirements for this degree either. Essentially, most schools require students to complete 120 credits to graduate and they have a very specific schedule of completion. Many schools allow students to work through this coursework part-time and full-time. The difference will consist of how many classes a student will take per semester. Full-time students will likely take four or five classes per semester while part-time students usually take two or three classes per semester. All programs, just like a traditional bachelor’s degree program, start with introductory coursework. Classes like Introduction to Communications, Medical Terminology, Introduction to Statistics and Social Sciences are a staple in any of these online counseling degree programs. Once a student has completed the intro courses, the subject material will get more specific and advanced. Courses like pharmacology, education psychology, child development, counseling skills, addiction counseling, ethics in counseling and juvenile justice are all examples of advanced courses that are common in any type of counseling degree program. Almost all states require licensed counselors to have obtained at least a master's degree in the subject, which is why bachelor’s degrees in the subject are not only rare, but they also don’t serve much of a purpose in terms of launching a career as a counselor. Students who intend to try and find a career in the mental health space, will find their options severely limited if they only have bachelor’s degree in the subject. There are administrative positions and mental health assistant or caseworker positions that are available. There may also be research assistant positions. But none of the jobs available will involve actual counseling work because that would be in violation of state regulations. It is highly encouraged and recommended that all students who get an online bachelor's degree in the field consider using that as a launching point to an advanced education path in the subject. In the counseling education landscape, the Master’s degree is king. It doesn’t matter whether your degree is from a traditional program or an online program, without a Master’s degree, most states won’t even let you apply to be a licensed counselor. The world of online Master’s degrees in counseling is vast and dotted with fly-by-night operations and degree mills that charge an exorbitant fee for an essentially worthless degree. Thus, it is important to do the research on each program. The first step in that research process is to ensure that the schools in consideration are all accredited by a recognized accrediting body. Per CACREP, there are 44 online Master’s degree programs in counseling spread across 18 states. The degree programs range in subject from Clinical Mental Health Counseling (the most common type) to School Counseling and even subjects like Addiction Counseling and Career Counseling. This type of diversity in education is perfect for students who want the freedom and leverage to choose a program that is best aligned with their interests but it also makes research the intricacies of each school somewhat cumbersome. The good news is that standardized accreditation processes and state regulations make the coursework and format of the programs mostly similar. But there are plenty of differences, even in seemingly identical Clinical Mental Health Counseling programs. Characteristics such as price, resources and track record will all differ from school to school. Here are some of the basics of what to know about online master's degree programs in the field. Many schools will add additional requirements such as a live interview that is either conducted in-person or via Skype and essay questions related to self-evaluation, written communication, quality of work and competence. Some schools may even ask for a resume and past test scores. Things like extracurriculars, relevant work experience, volunteer history and internships will also always matter when it comes to deciding which program to select. Cost is an interesting variable for online Master’s degree programs. For example, state schools like Adams State University in Colorado or North Carolina State University will offer both in-state and out-of-state tuition as well as different (usually cheaper) tuition for its online courses. Adams State charges roughly $5,000 per semester for an out-of-state student enrolled full-time. North Carolina State charges more like $5,500 for a similar student. Then there are private, for-profit universities such as Capella University and Walden University. These programs are accredited but because they are private schools, they may charge per credit and tuition for a full-time student can range from $35,000-$45,000 per year. Then there are private institutions like Northwestern, which gets away with charging a premium price because of its prestige and name-brand. Northwestern charges more than $5,000 per course, which means a full-time student could spend more than $20,000 per semester and more than $50,000 for the year. Don’t forget that there are admissions costs, technology costs, textbook costs, student fees, application fees and maybe even health premiums to consider. Some of these will be one-time costs while others will be charged per semester. Most of these fees are standardized across institutions, but they can add up quickly and full-time students who complete a two-year program could incur up to $10,000 in additional fees depending on what they are paying for. It is important for students to be able to discern the difference between tuition per course, tuition per credit, and tuition per semester. Schools may charge in many ways and students will want to make sure they are comparing apples to apples if they are truly going to choose the most cost-effective option. Remember, there is almost always scholarships and financial aid available for students and the Office of the Registrar or the Office of Financial Aid at any school worth its salt should be more than willing to break down costs in language that is easy to understand. Most schools will offer discounts for students who can transfer credits, which is always something to consider as well. It is never a bad idea to call and check with each individual school before making a costly decision. The curriculum can be confusing because students can be enrolled full-time or part-time and there will obviously be different coursework for students in Addiction Counseling programs and Clinical Mental Health Counseling programs. Most full-time programs are comprised of 20-24 courses, a Practicum, and an Internship experience, all completed during six consecutive quarters. Part-time students will still take the same number of courses, still complete a supervised practicum and still complete an internship. But they will generally have the option to do so in either 9-or-12 course sequences. Many schools will also offer a Bridge program or Advanced Standing program. Bridge programs require extra coursework and are designed for students without any mental health coursework experience. Advanced standing programs are the opposite, they are for students who have already earned credits and are hoping to transfer them in. Coursework will be different for each program and it will depend, especially as the student gets deeper into the curriculum, heavily on the focus of the program. 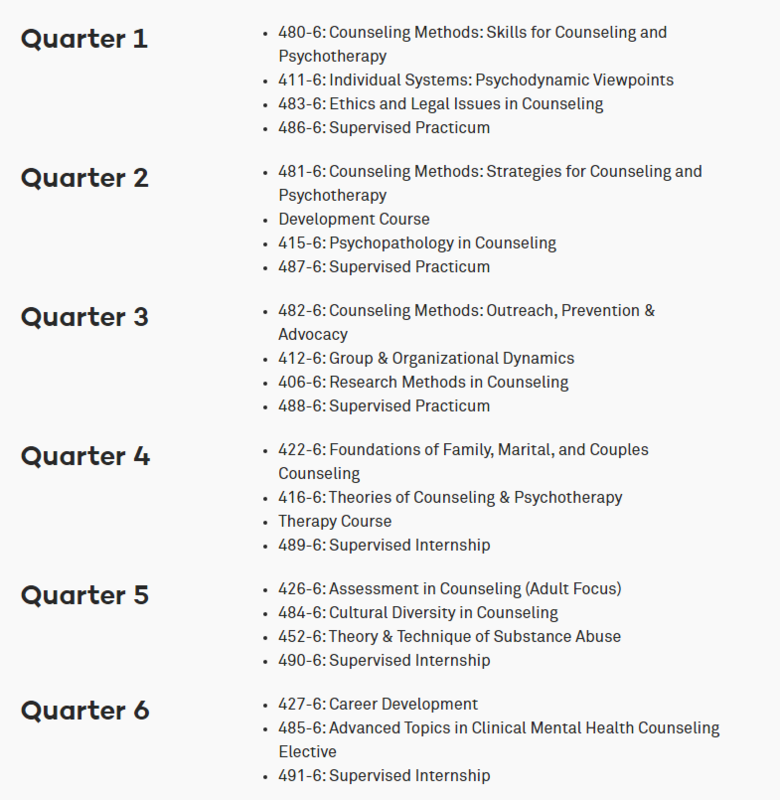 For example, below is a sample Master of Arts in Counseling course schedule. This one is from Northwestern University, which offers a degree in Clinical Mental Health Counseling. And just for comparison, here is a similar sample course schedule for the College Counseling program at North Carolina State University. 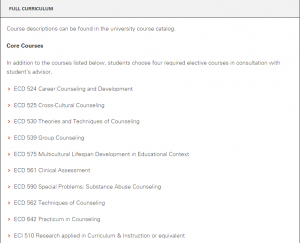 Keep in mind, in addition to these core courses, NC State students also take four elective courses listed in the University catalog. Another difference is that NC State’s online program is a three-year, part-time cohort model, which requires students to be on campus even during the summer. The other two major components of any online counseling degree program are the practicum and the internship. These are a required part of every curriculum because most states require students have accrued mandatory supervised work experience before applying for licensure. Students frequently conflate the two different requirements so let us explain the differences briefly. The practicum year is designed to give students clinical experience and training. Most students are required to complete at least 200 practicum hours, which can include work directly with clients, participate in group sessions, research assistance for supervisors and a variety of other experiences. Usually the programs are broken up specifically so that students receive roughly 200 hours of clinical experience, 50 of which are direct client contact, 50 are indirect client contact, and the rest are a myriad of supervised contact experiences. The internship is more expansive. Students usually will take a full year of an internship in conjunction with a lighter course load. Students complete a total of 600 clinical hours, which usually includes more than 240 hours of direct client contact. Internships are more than just performing well at the job however. Schools structure the internship to include supervision meetings to review training, record-keeping, weekly or monthly assessments, essay assignments and many other strategies that students can use to demonstrate comprehension. The United States Bureau of Labor Statistics separates counseling into several different categories. For example, there are statistics on mental health counselors, there are school and career counselor stats, there are substance abuse counselor stats, there are rehab counselor stats and there are genetic counselor statistics. The good news is that the BLS reports that employment in all of these fields is growing rapidly. From 2014 to 2024, counseling employment will grow anywhere from eight percent for school counselors to 29 percent for genetic counselors. Pay for these counselors can range from $40,000 per year to $80,000 per year on average. The landscape for online PhD degree programs in counseling is very small and very narrow. According to CACREP, there are five schools in the country offering an accredited online doctoral degree in counseling and one more school in the process of becoming accredited. Also, all six of the programs are in the same field of study – Counselor Education and Supervision. Most of the schools (well four of them) are for-profit universities, but the other two – Oregon State and the University of the Cumberlands in Kentucky – are not-for-profit universities. Most of these programs have been accredited in the last 10 years so the field is still relatively nascent, but there are some opportunities for interested students. Each program is going to look different of course, but considering that all six of the programs are in the same field of study and accredited by the same governing body, the coursework and curriculum are very similar. Each program is going to require 60-70 credits for graduation, which should take the student four terms to complete. All PhD programs will include aspects of their curriculum such as residencies, internships, dissertations, research methodology, statistics and advanced counseling theories. Some programs may include electives such as Counseling of Women, Models of Family Therapy, Advanced Psychopathology and many others. The program at Oregon State does require students to attend a face-to-face class in Oregon twice per term. Cost isn’t outrageous either. Cost per credit will range from $500-600, which means a student can expect to pay anywhere from $30,000 to $40,000 per year, depending on how many courses they enroll in and depending on the school. Remember, every school, no matter the program, charges fees for textbooks and technology, etc. So make sure to research those fees to stay within budget. The focus of the PhD in Counseling program is on advanced practice, counselor supervision and counselor education. The role is in counselor education and all PhDs are meant to be research-intensive degrees. As a result, common employment for graduates from these programs include positions as professional counselors, university leaders, school/organization administrators, lead researchers, agency/clinic directors and clinical practitioners. Let’s put this as bluntly as possible. There is absolutely no reason why any student interested in becoming a licensed counselor should be attending a program that isn’t accredited by CACREP. This isn’t meant as an ode to CACREP, it is merely of a statement of fact. States require licensed counselors to earn a graduate degree and nearly all of them specifically note that the degree needs to be from a regionally or nationally accredited degree program. The U.S. Department of Education describes accreditation as the process for ensuring that institutions of higher learning meet “an acceptable level of quality”. CACREP lays out its standards for accreditation very clearly on its website and it updates these standards on a yearly basis. They are thorough and detailed and designed to ensure that all programs understand exactly what is expected of them. Accreditation is especially important for students considering online counseling degree programs because they are still new and thus less likely to be accredited. There are lots of bad actors and degree mills in the online education space and accreditation is an easy and simple way to separate the worthwhile programs from the bad ones. Online schools are going to have a more difficult road to accreditation than traditional ones. But that is a good thing, because it ensures the quality of the online program and ensures that there will be licensure and thus employment opportunities after graduation.